Located on the south end of Anna Maria Island, Leffis Key Preserve has panoramic views of Sarasota Bay and the Gulf of Mexico. Packed shell trails and boardwalks traverse a combination of mangroves, mudflats, tidal ponds and coastal ridge. After walking over the bridge, check the mound on your left for Common Ground-Doves. 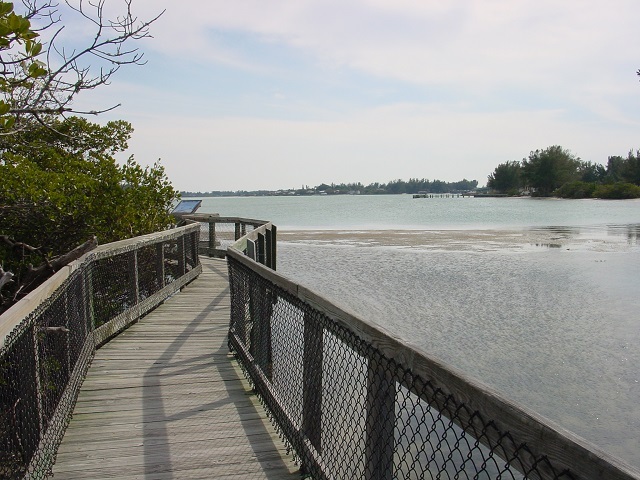 Explore the brief trails and boardwalks which run through the hardwood patches and mangrove forest to observation platforms on Sarasota Bay. Look and listen for songbird migrants in spring and fall—Yellow-throated Vireo, Gray-cheeked Thrush, Black-throated Blue Warbler, Rose-breasted Grosbeak and Orchard Oriole. You may spy a Yellow-crowned Night-Heron in the shadows and Reddish Egrets dancing on adjacent flats. Watch for flocks of Magnificent Frigatebird gliding effortlessly overhead April to early October. Rarities such as Bridled Tern, La Sagra’s Flycatcher, Bell’s Vireo, Nashville Warbler, Connecticut Warbler, Townsend’s Warbler, and Western Tanager have all been recorded here. Dogs are not allowed at this site. Restrooms are available across the road at Coquina Beach.